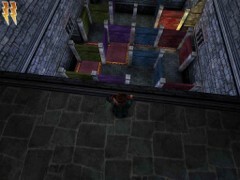 [4.1] Return to the Dungeon Entrance: that is, descend the Monumental staircase and enter on your right. 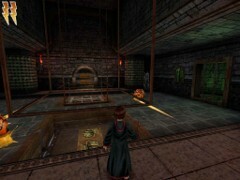 You’re standing in the main Dungeon corridor, and you recall that four areas are accessible in here. 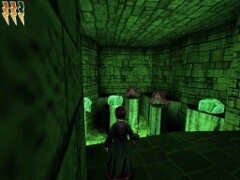 Harry needs to go through the Dungeon corridor #3 blocked with Ectoplasm to find some powdered Bicorn Horn. You have time for some extra exploration of the corridors, so let’s do that first. Go inside corridor #1 and to your left in the antechamber a boy (Flobberworm Mucous) and a girl (Wiggentree Bark) would like to trade with Harry. Accept or recall. However we’ll stumble upon sufficient of that stuff further in this level. 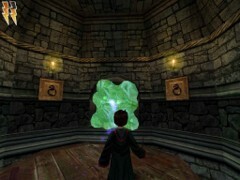 Next you’ll be entering the Potions classroom with Prof. Snape walking around in there. Cast Alohomora the “S” sign on the wall left of the entrance. Skurge the Ectoplasm and grab the Beans. Step on a Switch that was trapped by the blob and watch 3 blocks lifting up nearby. 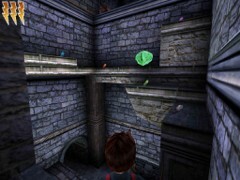 Climb the blocks like a giant staircase, starting to your right from the lowest block and jump inside through the opened window. Take the Beans and open the chest for your 10th silver Wizard Card # 60: Laverne de Montmorency, 1823-1893 Inventor. Go down and explore the classroom a little further. Go see the chest in the corner that you were not allowed to approach last visit. Cast Alohomora for the bronze Wizard Card # 9: Gunhilda of Gorsernoor, 1556-1639 one-eyed-hump-backed Witch. There is a door in the other corner that is sealed. Would this be the room where Snipe keeps the Bicorn Horn? In the dungeons again? I wouldn’t be surprised if you became hopelessly lost, says Snipe. Notice the bottles on the table and leave here. Cast Skurge on the Ectoplasm and Lumos on the entrapped Gargoyle. That will unveil a rope in a corner cabinet. 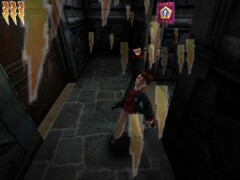 Hmmm…it seems like Harry will need a future Spell for cutting the rope. Remember that rope in this room. Explore corridor #4. The door upstairs is sealed. 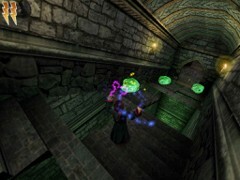 Now enter the 3th corridor, and upstairs cast Skurge on the Ectoplasm blocking the entrance door. 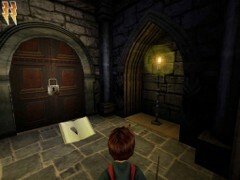 [4.2] Enter a dark room with a locked door and behind your back the entrance door seals off. 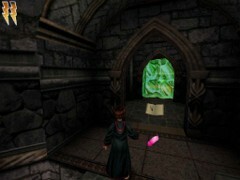 Harry is trapped inside the Dungeons and is going to spend quite some time in here. Take the Beans on both sides of the door. 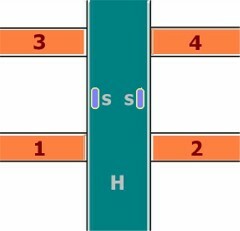 Cast Alohomora and enter the corridor with cell windows. Watch the spiders, you can step on them and squeeze them. If not, they might climb your back. Approach and look in the high octagonal room. There's a tall beam in the middle above a pool of greenish substance. Notice two Flipendo spirals on the wall? Cast a Spell on each of them and the beam will be twisting up and down. Jump on the platform on top of the beam and ride up to the Ectoplasm above you. 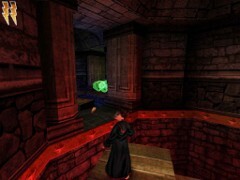 Cast Skurge on the blob and jump into the hole that is rendered accessible. Skurge the Ecto and quickly jump inside. 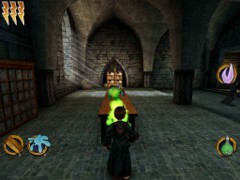 The two chests in the corners each contain a Chocolate Frog. Ride the beam downward and jump to the middle window. Inside is a cauldron to flip aside for BB Beans. 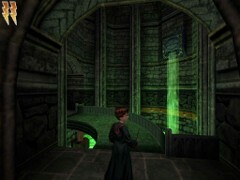 Cast Lumos on the Gargoyle and watch a cut scene on the gaps between the stairs in the lower passage. Ride the beam one floor lower and jump to the stairway. Immediately stun the Cornish Pixie with Rictusempra. Easy on those gaps in between. Cast Skurge on each of the four blobs, and carefully jump from spot to spot. Enter an antechamber and grab some Beans. You’ll arrive at the next octagonal room. Skurge the Ectoplasm higher up that is sealing off a Gargoyle face and fill up the pool below Harry. Follow left and don’t miss the chest in a dark niche. It contains the bronze Wizard card # 6: Glanmore Peakes, 1677-1761 Famous Slayer. Turn around and cast Alohomora on the wall sign. That will open a small reddish room with a chest. 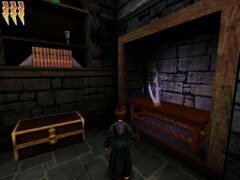 This chest contains the silver Wizard card # 42: Crispin Cronk, 1795-1872 Sent to Azkaban. Proceed following left and arrive at a large room with two Giant Orange Snails. They each must be thrown on the front plate. That will allow two Fire Crabs appearing on the second plate that comes up. Each of these Crabs must be pushed inside one of two smaller rooms with a Crab sign. Explore each room first. You’ll find Beans and a bottle with Wiggentree Bark. Cast Flipendo on the bottle and catch the Bark. Now stun each Crab with Rictusempra and push it with Flipendo into one of the rooms. Once the Crab is thrown inside a grilled door will close, thus trapping the Crab. When both Crabs are locked up the exit out of this area is assured. Flip the cauldron in the corner and go to the next area where you'll stun two Pixies first. To your right Skurge a first blubber that blocks the ledge. Walk down the stairway. Skurge the second Ectoblob next to the purple Bean. Follow the ledge that is released. 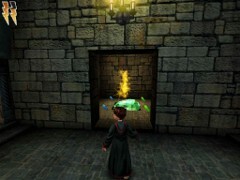 The third Ecto is by the green Bean under a cauldron on a higher ledge. 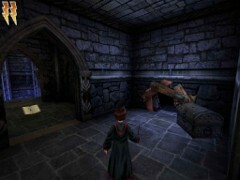 Return to the previous room and cast Lumos on the Gargoyle. Come back and turn left, and jump to the charmed ledge. Follow all the way around and enter another room with two Giant Oranges ones. 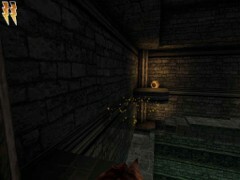 Just like in a previous area there are two smaller rooms: with Snail signs inside. First go in there for Beans and a Chocolate Frog. Flip each Snail inside a room. Once both Snails are jailed the exit door will open. Cast Alohomora on a chest for the bronze Wizard card # 2: Cornelius Agrippa, 1486-1535 Celebrated wizard, then enter the next area. 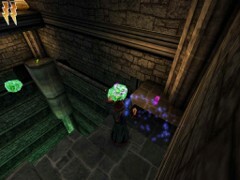 [4.3] You then arrive at your third octagonal room, this time in blue. Skurge the blob that releases a staircase going down. Turn right, take some Beans and enter a balcony room with a Giant Snail. Stun it and throw it into the deep down below. First pick up some Beans in the corners of the balcony and don’t open the chest ‘cause Peeves is in there! Notice 4 Flipendo spirals on differently colored beams up in front of you. From left till right: green, purple, blue and red. Look down from the balcony and you’ll see a kind of labyrinth of colored doors matching with the colors on the Flipendo signs. Notice a stunning red tile in the left corner’s niche down at the end. Above the niche is a sign on the wall, looking like a Roman number III. Two more of these signs are visible, apparently indicating two more such niches. The red carpet leads to the exit out of the labyrinth to your right. We’ll have to clear the carpet by switching a number of doors. Casting Flipendo on one of the colored signs will shift the matching doors below. First shift the red doors with a spell of Flipendo on the red sign. There are two elevators. One is going up, the other down. Go down and quickly stun and throw the Gnome in the hole. Run and jump over the void to entrance #3 (the only one that is accessible for now). Turn behind the corner past a blue door and you’ll spot the niche with a green tile. Cast Alohomora on the tile and open a small green room with a chest inside. The chest contains some BB Beans and a bottle with Flobberworm Mucous. Cast Flipendo on the bottle to break it and grab the Mucous. 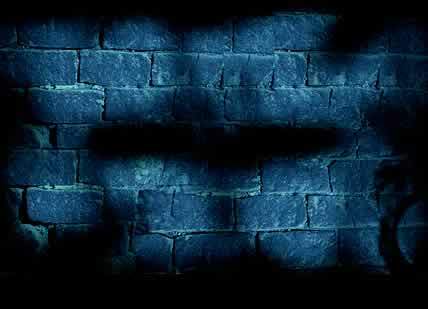 Proceed to the other wall and find the room with a blue tile. The chest in the blue room contains Beans and two pots: more Flobber Muke and some Wiggentree Bark. Break the bottles and get out the stuff. Return, cross the gap and take the elevator riding up to the balcony. From here you can see how the third niche in the corner with the red tile is blocked by a green and a purple door. Now cast Flipendo on the green sign. You can now see from above of how to reach the red room. Go down and cross over to entrance #1, and head for the red room. The chest contains a pot of Wiggentree Bark and more Beans. Now all we have to do is find the way to the exit. Return upstairs and hit the red and the purple signs with Flipendo, that will clear the path along the carpet. Jump to entrance #1, run along the red carpet and leave this room. You will then arrive at a room with bottles and chests. Turn left past the stairs going down and jump on the chest. From there you can catch the Beans on the shelves next to a pot of Wiggentree Bark. You can’t open the chest, at least not this kind of chest. In the alcove next to the ladder find the bronze Wizard Card # 46: Miranda Goshhawk, 1921-present Famous spellbook writer in a chest that does open up with Alohomora Spell. Cast Flipendo on a small wall sign to free the way out of here. Jump on a small table and catch a couple of BB. Beans. Push the block toward the wall cabinet, jump on it, take 4 Beans and the bottle with Flobber Muke. Leave the Room and flip a cauldron to your right and get the Beans. Now you’ll be entering an orange octagonal room. Quickly take care of a sneaky Fire Crab in ambush. Cast Rictusempra on the bugger and then throw it down in the goo. Follow the stairs to a Bean and a Save Book. [4.4] Skurge the Ectoplasm, enter and cast Rictusempra on the Pixie. This is the red octagonal room. Skurge the Blob and a sort of cog mill will start turning. 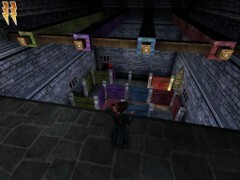 Jump on the revolving platform on the beam in the middle and exit to the blue octagonal room. Pick up an orange Bean. Jump on a similar beam platform and Skurge the two blobs. Take a green Bean and jump to a green octagonal room. Jump on the platform and on to the red room. Grab the blue Bean. Skurge two blobs and jump out. 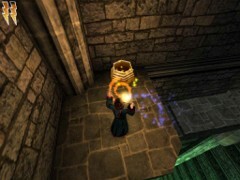 Flip the cauldron and now go save again. 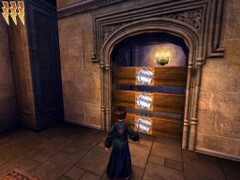 [4.5] There is another door with a lock and you can hear a Gnome grunting from behind. The Gnome is sitting by a chest to your right. Stun him and carry him to the next room. There is a hole in the left wall (watch out for a Fire Crab on the ledge). Quickly throw the Gnome in the hole and turn around. Cast Rictusempra on the Crab and jump to the ledge. Flip it into the hole under the Ectoplasm. Go down, return to the chest where you stunned the Gnome and open it. Get your 20th bronze Wizard Card # 4: Grogan Stump, 1770-1884 Popular Minister and earn a third Health arrow. Three Health meters for Harry! Hurray! Proceed to the room with the Gnome hole and flip the cauldron for some Beans. Climb the ledge again and Skurge the blob above the Crab hole so you may jump on the ledge. Climb a second ledge and turn around. Follow the path like is suggested by the Beans. Skurge two blobs up there and climb to the top ledge with the Gnome and the hole. You know what to do. Before Skurgeing the blob look at the other side to a second top ledge. You’ll be going there soon. Now Skurge the blob and blow 4 Pixies out of the air in the opened cave. This is a cave with floating ledges. Skurge the blob to your left and return to the second top ledge in the previous room. Eat the Chocolate Frog and cast Flipendo on the big block. The block will move aside and open a room. 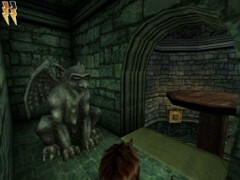 Meet a Gargoyle in there and cast Lumos on him. Watch how a secret room in the cave is then unveiled. Return to the cave and enter this room from your left (the Ectoplasm was blocking your way). Open the chest in the room for some Beans. Skurge the second blob and walk towards the locked door. Thus you have avoided some tricky jumping to floating ledges. Cast Alohomora and enter another room with pots and pills. Be prepared for a nasty trap in there! Take all the Beans from the shelves to your left and open a bottle containing Flobberworm Mucous. Grab more Beans on the next shelves and turn around the corner. You’ll suddenly drop down through a trap-door and end up in a cave with two fire Crabs sitting on blocks above some acid looking green substance. Cast Rictusempra on the Crabs and then Flipendo to get them into the goo. Skurge all 4 Ectoplasms and jump from block to block to the opposite side. Climb all the way out into a second storage room. First go left and take 4 Beans. Take the Bicorn Horn from the shelve in the cabinet. 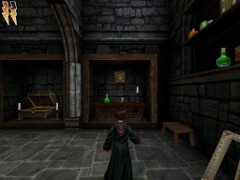 In a fast cinematic Harry returns to the Potions classroom. [4.6] Go to the large table with all the bottles and if you didn’t take them last time, cast Flipendo on the bottles with Flobberworm Muke and Wiggentree Bark. Don’t pay any attention to Prof. Snipe, he’ll keep saying nasty things to Harry. You’ve got one Wiggenweld Potion and six Mukes and Barks for making six more Potions. It’s time for practicing Snipe’s lesson! 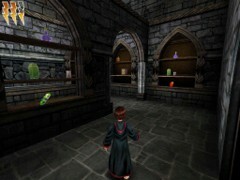 Turn towards the smoking cauldron and your 6 new potions will be automatically concocted. 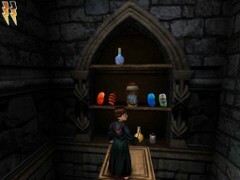 Harry has 7 healing Potions now in case of Health emergencies! Leave the classroom for the main corridor and Harry runs into Hermione. Hi, I found some Bicorn Horn to add to the potion! 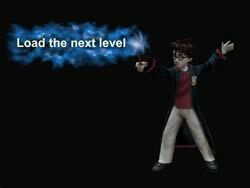 Now Harry means for the Polyjuice Potion, remember? 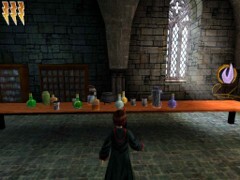 Hermione: Great, I’m still trying to find the location of the next ingredient, but I should have it tracked down soon. She runs off and goes adding this to the Potion. Then Ron arrives: They’re starting a Dueling Club and the first meeting is today! Come to the Great Hall if you want to learn how to duel. 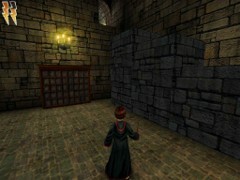 Follow Ron to Hogwarts’ majestic entrance Hall but don’t enter the Great Hall yet. Let him wait on you for a while and go up the Grand stairs. Take the way to the Room of Floating Ledges and go left past the door. Ride the first of Floating ledges to the room where Nick explained about the Four Locks. Since you’ve got over 10 silver Wizard Cards, approach the door and watch a first Lock sliding open.